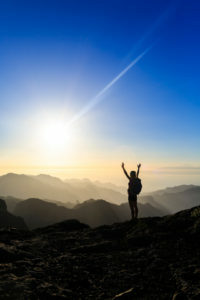 The topic of resilience in positive psychology deals with the ability to handle the challenges of life, challenges that can sometimes feel overwhelming. Some people have the capacity to endure difficult, even tragic, life events, and come back a stronger person than before. This capacity is the hallmark of a resilient individual. We often look at a person who is able to rebound after painful and difficult times, and assume that they are somehow stronger or more courageous than the rest of us. Not so! Being resilient isn’t a characteristic you are born with. More typically it is a quality that is developed over time by facing and going through difficult times and developing one’s inner resources in the process. Resilient individuals frame difficulties as potential learning experiences, opportunities to solve a problem, and to grow personally. They draw on their own capacities for learning, maintaining perspective, and managing their own emotions. They don’t give up at the first sign of difficulty, rather they view setbacks and failures as chances to learn a better way to do it next time. Given that we are all going to face obstacles and setbacks at times, the question becomes how to foster more resilience within ourselves and help those we love do the same. Psychologist and author Carol Dweck has defined two different types of mindsets – a fixed mindset and a growth mindset. People with a fixed mindset believe that the talents and abilities they are born with are fixed – that is, they are given a certain set of characteristics and that is pretty much that. For example, you are born with a certain amount of intelligence and that is all you have. Your intelligence is “fixed.”People with growth mindsets believe that, while they may have been born with a certain amount of potential, that potential can always be further developed by study, effort and their own determination. They are able to keep the big picture of their long-range goals in mind, enabling them to move past temporary setbacks, even failures, by viewing them as opportunities for learning and improvement. teamwork, bravery, judgment and perspective.A good way to start to become aware of your strengths is by asking people close to you. Are there certain things that you are naturally good at? Maybe you are naturally a giving and kind person, someone who typically goes out of their way for others. You might be the creative in the family – doodling and drawing whenever you have the time, you have a unique eye. If you tend to be a bookworm, love of learning might be high on your list of strengths.Identifying and leveraging your character strengths is a way to begin to develop your sense of confidence and competency, and strengthen your sense of self, all of which can contribute to being more resilient in times of stress. See Obstacles as Challenges Rather than Deterrents.It’s easy to become discouraged or even quit when confronted with setbacks or roadblocks. Resilient people look at obstacles as opportunities. A low grade on a project thus isn’t viewed as a failure but as an opportunity to improve and do it better next time. Viewed in this light, a problem can be viewed as something that has happened for you, rather than to you.By acknowledging the difficulty and resolving to come at it again from a different perspective, your sense of personal resilience is strengthened, and you grow in self-efficacy. Here’s an action step: Identify a problem or situation that you are struggling with. Come up with 2 or 3 approaches that you might take to solve it or improve it and see what happens. If the first way doesn’t work, try another. By taking small actions such as these, you are on your way to building more resilience and faith in yourself. And resilience and faith in yourself are inner resources that you can depend on. What about you – what are your experiences in facing significant challenges? What helped you not just survive, but learn and grow? Please share by commenting below so we can all build ways to be more resilient.